A leaked marketing slide from AMD reveals the company's Trinity APU promises 29 percent higher productivity and 56 percent faster visuals than Llano. 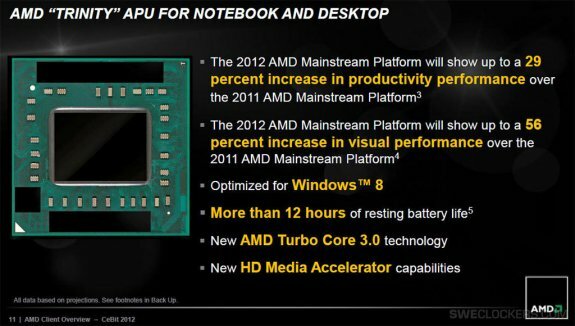 AMD claims mobile devices based on this platform can achieve a resting battery life of over 12 hours. Apart from these, the slide claims Trinity to be optimized for Windows 8 (with AVX, AES-NI, SSE4.2, and DirectX 11.1 graphics, it could very well be). The processor is said to feature third-generation auto-overclocking technology, TurboCore 3.0. The mobile version of the chip will be designed to offer over 12 hours of resting battery-life. Lastly, there's mention of new media-acceleration features. AMD is expected to launch its new line of APUs in this quarter (before July).